Cody has managed to perfectly capture the ship’s lines — no small feat when it’s such a collection of angles. I’m sure he was pleased, but also slightly nervous, when the latest game featured the Infinity so prominently on its loading screen. If you’re building a model from a source with such a rabid fan-base, you’re going to have to get the details right! Beyond the shaping and the impressive scale (134 studs long), the blue LED lights within the vessel really add to the feel of a working starship. But for me, the little touch that sets this model apart is the attention Cody paid to the base. 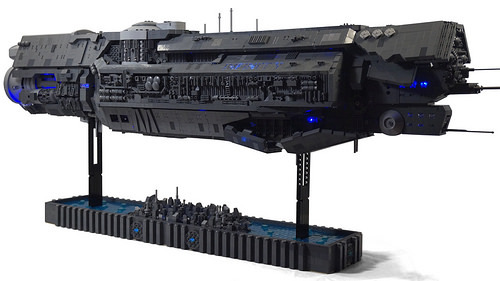 Often big spaceship builds like this are supported on ugly stacks – a functional afterthought detracting from the appearance of the model as a whole. Here, Cody has gone the extra mile, lavishing the same attention to detail on this element as the main ship itself. Great stuff.